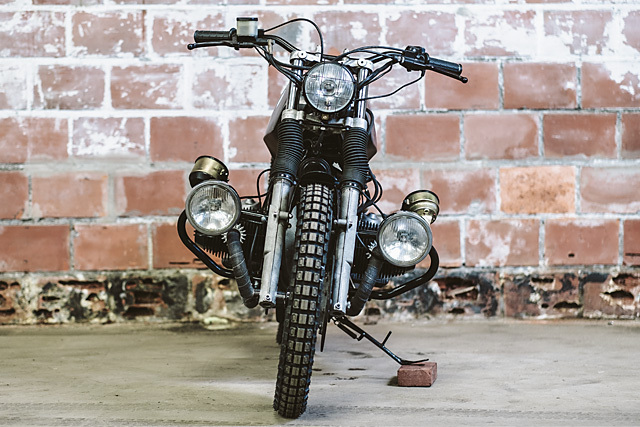 From an old factory in the Dutch city of Roosendaal, Daan Borsje and his team at Moto Adonis share a common purpose of “building awesome vintage bikes”. 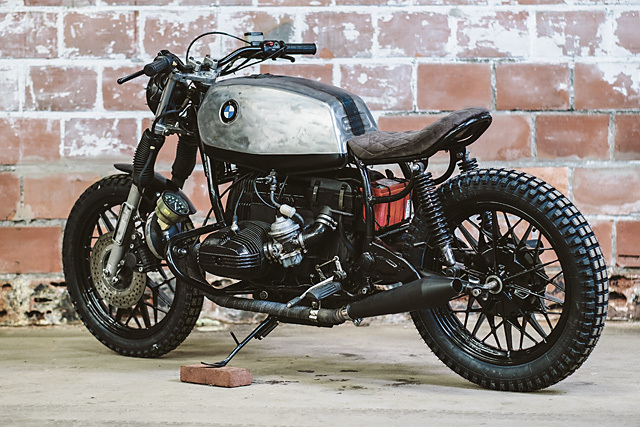 Having shown they can build clean vintage customs with an impressive portfolio of both European and Japanese vintage machines, they decided to take a different path on this, their latest build. 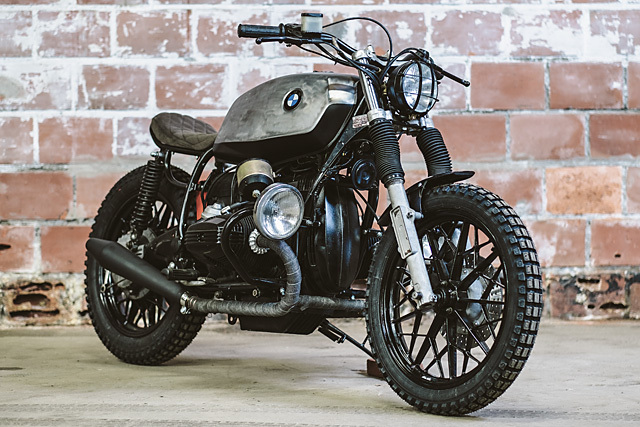 From the remains of an old Dutch Police Bike, a BMW R65, they have created a Neo-Utilitarian Scrambler that wouldn’t be out-of-place shredding the boggy fields on the Keutenberg or centre stage in a new Mad Max film. 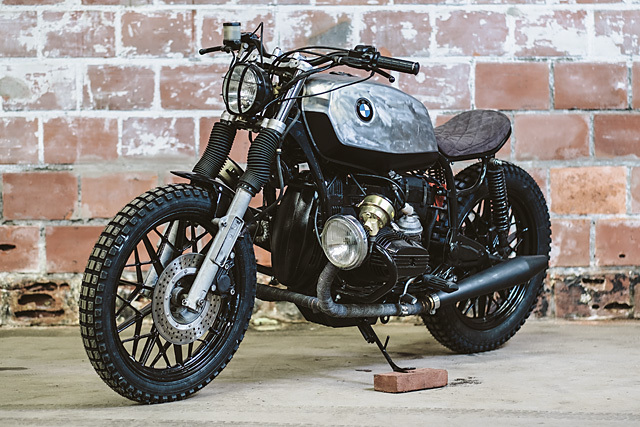 Stripped of all its law enforcement paraphernalia, the little BMW from the R range was taken back to bare bones to reveal the outlaw within. The “shorty” rear end is becoming more popular by the day, turning long two up designs into a sleeker more stripped down look. 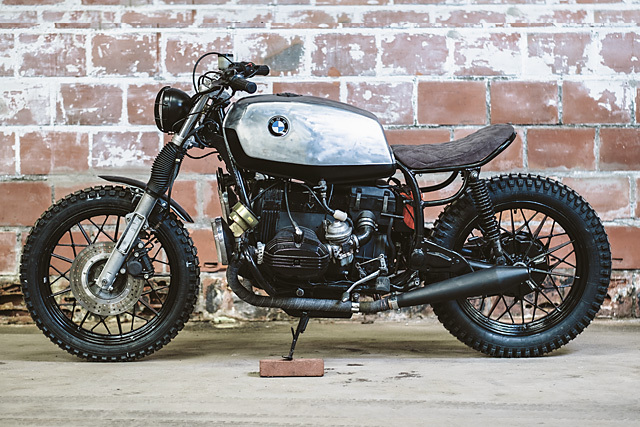 But very few builders go as far as Moto Adonis have on this build to ensure the look is engineered for perfect functionality. Hacking the back off a frame can do all sorts of things to reduce chassis rigidity and compromise the rear suspension, so to counter this they’ve built an entirely new subframe with twin loops to support each side and a single piece kicked up rear hoop at the back to support the seat pan. The whole frame and new subframe was smoothed out, detabbed and finished in black. Adding some serious class to the build is the handmade, diamond stitched, Alcantara covered seat that keeps the rider’s weight close to the centreline of the bike. 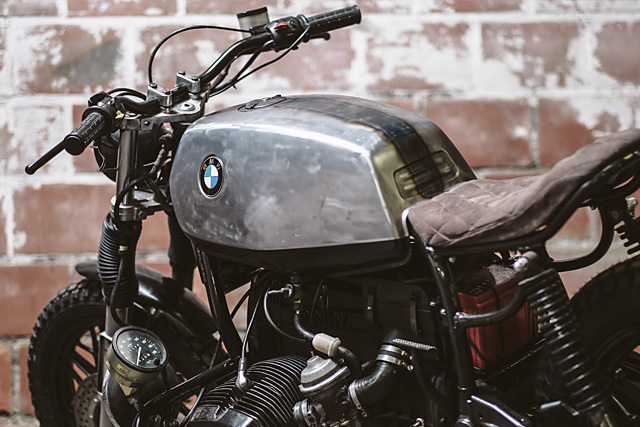 The factory tank is the classic BMW design of the era, while everyone else was going for rounded flowing aesthetics, the Bavarians had a completely different take with a boxier, slab side look. To continue the neo-utilitarian theme the boys have stripped back the paint to the bare metal with the sanding marks left very deliberately in place. The undersides are painted matte black to further accentuate those beefy metal sides and a totally new take on a centre stripe was achieved by firing up the blow torch and laying down the flame. 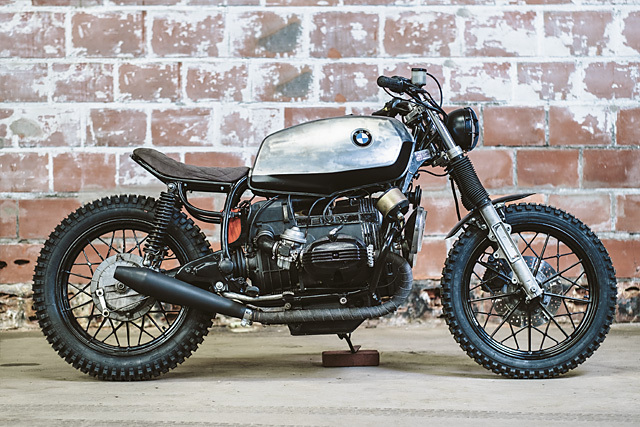 It’s a Mad Max style touch that while out of left field fits perfectly with the overall theme of the build. To complete the minimalist body work a bobbed front fender is finished in the same black as the frame. Also painted in black the BMW crash bars that protect those exposed airheads would normally go largely unnoticed and on most customs they’re often removed. But here they serve a purpose and drastically add to the look of the bike, to serve their roll they’ve been modified with the addition of two new brackets each side. These hold the new twin spot lights that stare down the road like a vicious animals eyes and light the dark like no other motorcycle. Joining them on the crash bars are the factory speedo and tacho which required a total rerouting of the drive cables. Providing the third eye from the standard location a grilled out headlight further enhances the BMW’s “tough” credentials. Steering the beast is a set of Motocross bars that have the factory switch blocks cleaned up and mounted to them. 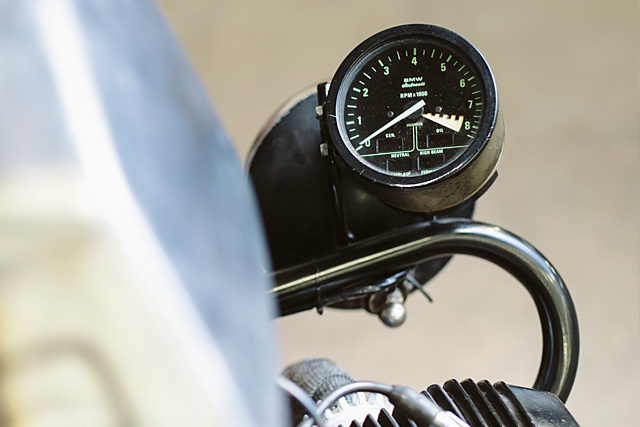 One of those buttons fires the distinctive 648cc flat twin airhead into life and it is the perfect scrambler engine. What it lacks in horsepower it makes up for with gobs of torque right across the rev range and the flawless fuelling of the Bing carbs means wheel spin is easily controlled on the throttle. 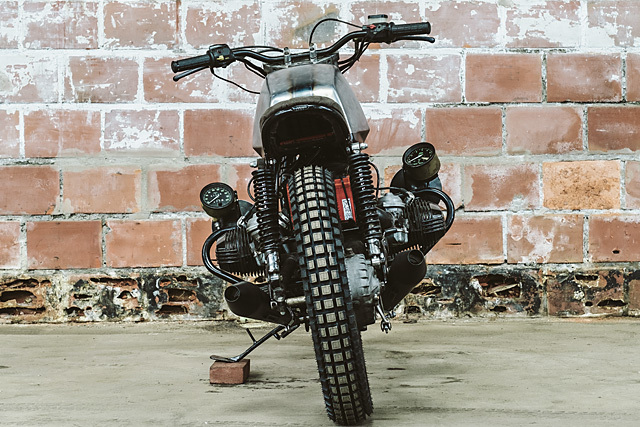 To get a little extra power and add to the aural arousal of the boxer burble the guys fitted up a pair of hooligan mufflers to the factory pipes which have been heat wrapped to avoid pipeburn. 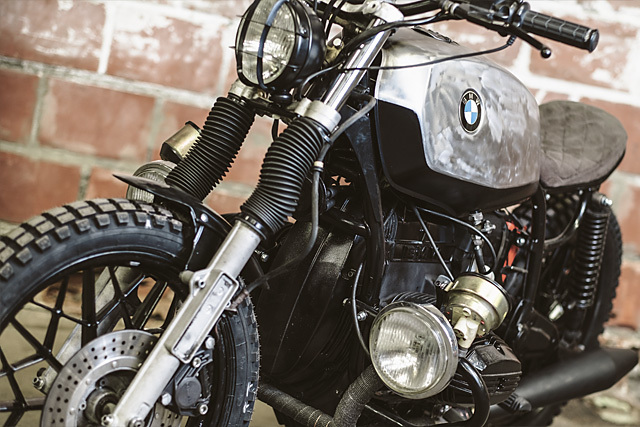 (Why would anyone want to avoid Pipeburn? – Andrew) While the airbox remains, the engine has been largely blacked out and in true utilitarian style the battery is on display for all to see. If there was a perfect tyre for a BMW Scrambler it would have to be the Motocross range from German company Heidenau and these are exactly what the guys have fitted. A no nonsense dirt tyre in a traditional trials tread pattern they’ll handle any surface you can throw at them and the build quality is first class. These have been fitted to the factory BMW wheels that are finished in a striking black powder coat that was also applied to the shaft drive, hub and other components for a durable finish. 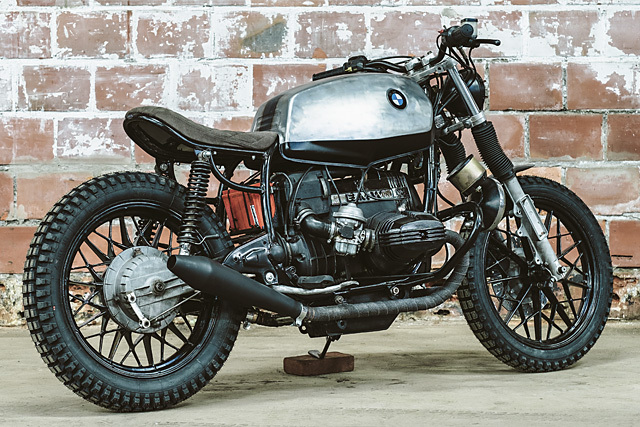 The last thing you want on a Scrambler is a brake that is going to lock and fold the front end over, here the engineers at BMW had a solution long before ABS and Moto Adonis have kept it in place. The factory master cylinder features a piston significantly smaller than that of the caliper piston, providing a piston to piston ratio far greater than was considered normal at the time for unbelievable progressing stopping. A nice finishing touch is the small, tiny even, LED tail light that is mounted inside the rear hoop. Its proportions could not be more dramatically opposed to that of its forward facing counterparts; Which just goes to show this Dutch Scrambler is utterly focussed on what is ahead and will take you on a journey anywhere you can think to go leaving the rest of the world behind as you chase the light at the end of the tunnel.